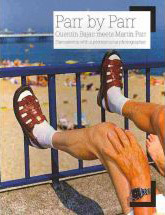 A must for any fan of social documentary photography, Parr by Parr - Quentin Bajac meets Martin Parr - Discussions with a promiscuous photographer; Schilt, 2010, is an extended interview in book form. Able to be read in a sitting or two, this book explores Martin Parr's beginnings, his motivations, methods, the evolution of his subject matter and means of presentation, as well as delving into his involvement with the Magnum photo agency and the possibilities this has facilitated. The book contains a cross-section of his images, from early black and white work in 1975, to celebrations of colour as recent as 2009. The Parr humour and juxtaposition of subjects within the frame were there right from the early monochrome images; but it was the addition of colour and flash in the eighties which defined his instantly recognisable aesthetic. The greatest area of interest for me was the discussion of Parr's probing and evolving exploration of his subject matter - English middle class culture, through global consumerism - which is discussed in a down-to-earth and accessible way.